A few days ago we have posted our first test results from the new Gridseed Blade Miner. We got early remote access to a single unit that we were able to test and report our findings before the devices actually started shipping thanks to our friends at MinerEU who are an official Gridseed EU distributor. Meanwhile we got a second unit attached to the system we were testing, so we were able to run some longer tests with two devices in order to see what variance we can expect from device to device. We also expanded the tests to cover various usage scenarios to check what hashrate you can expect to get if mining for a fixed higher difficulty coin such as LTC as well as if you are mining in auto profit switching mode to mine the most profitable crypto coin. Meanwhile the new Gridseed Blade Miners should start shipping tomorrow, so the people that have ordered them should start receiving their units very soon. We are starting up with a result showing the two Gridseed Blade Miners, each of which is reported as two separate devices, fixed in mining for LTC with a worker difficulty of 256 at the scryptguild pool. The Blade Miners are running at 800 MHz, a frequency that can normally provide up to about 5.6 MHS in mining a fixed crypto currency with higher worker difficulty. Note that one of the PCBs, namely the GSD 1 device does report a lower actual hashrate and that is a direct result of getting some HW errors from that PCB. It seems that this could be related to the cooling not giving a good contact to one of the PCB sides for example, so we recommend to inspect your miners and if needed to optimize them a bit before running them, just in case and to get the best performance. This is something that we recommend doing for the smaller 5-chip Gridseed ASIC devices as well, especially if you plan to overclock and voltmod them, you need to check the contact between the cooler and the chips. Notice that the poolside result is pretty much consistent with the local reported actual hashrate. 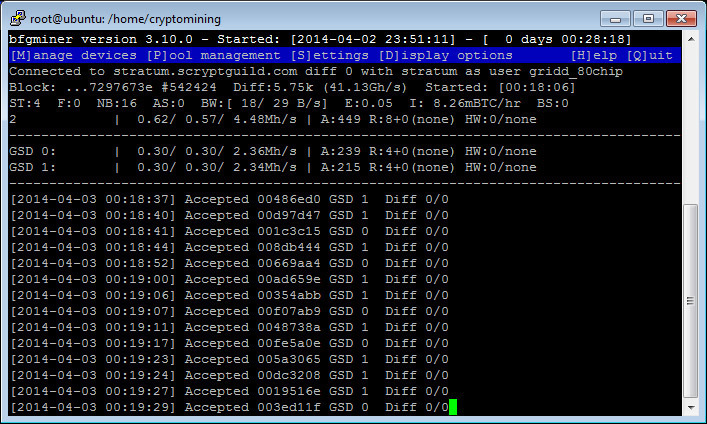 Do note the other worker above the Blade miner, it is from a voltage modified 5-chip Gridseed ASIC running at about 490 KHS local hashrate (1150 MHz). You can see that with close number of submitted shares to the pool, the number of rejected (stale) shares is almost twice as high on the smaller ASIC as compared to the Blade Miner. 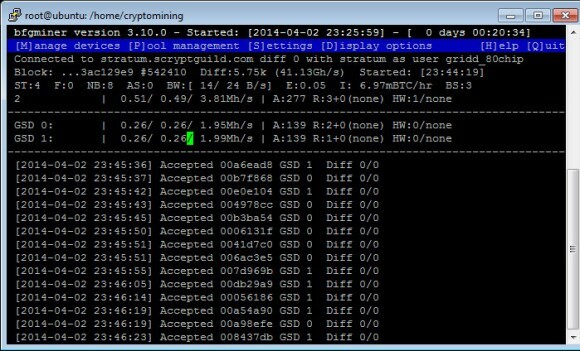 The reason for that difference is that the small miner is running on automatic profit switching and 64 worker difficulty, so it gets more stale shares due to the often switching between different crypto coins and due to the fact that some are with lower difficulty and many blocks are calculated quickly. 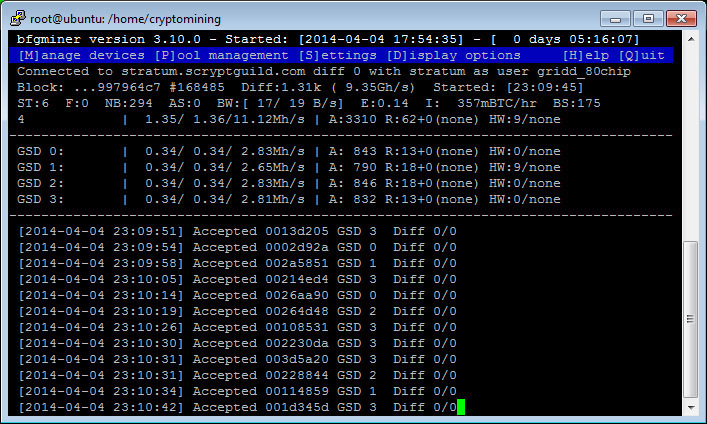 So how about leaving the two Gridseed Blade Miners for a few days to run in auto profit switching mode at 64 worker difficulty at scryptguild, the miners were running in 800 MHz. 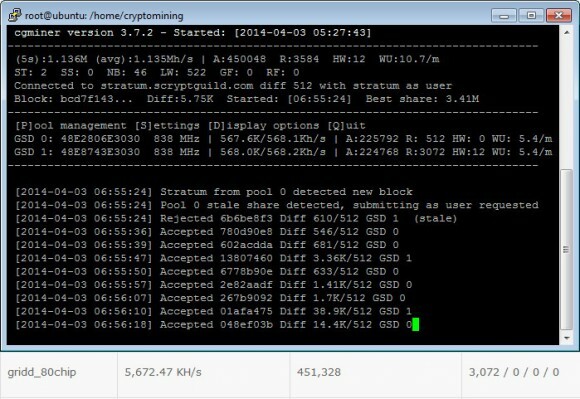 The result is quite interesting, local hashrate reported at about 5 MHS per device with about 6.8-6.9% of stale shares (the percentage is higher as expected) and more HW errors that you would normally get if mining for a specific coin only. What you should be well aware of is that based on the pool and the type of mining you are doing you might be getting different performance that could be lower or higher than what the official specifications about the miner say. 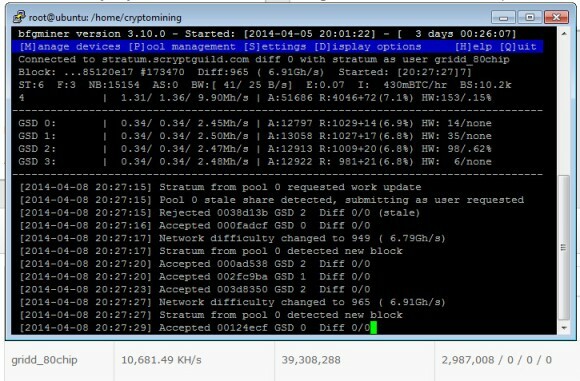 Using automatic profit switching pool might help you get more profit than mining directly for LTC for example, though the extra percentage you might get may be lower in reality than what your raw calculations may show initially as you could be getting more stale shares as well as more hardware errors this way. 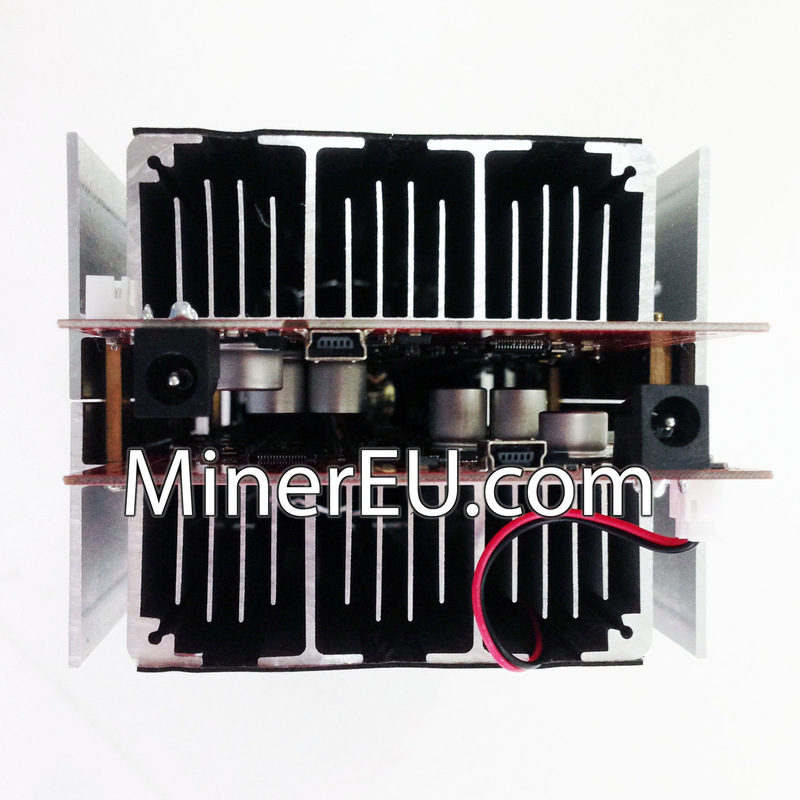 So far we are satisfied from the results we are getting from the new Gridseed Blade Miner, though at the moment due to the uncertainty and the lower Bitcoin and Litecoin prices, people seem to be very careful in general when considering to buy ASIC hardware. And we are not talking only about investment in very powerful and very expensive mining hardware that is expected to ship later this year. If you remember the story from last month about an supposedly upcoming 19.2 MHS Scrypt ASIC based on Gridseed chips that was briefly put for preorder on aliexpress by a Chinese seller with not a lot of details, then you would be interested to read this exclusive information hat we just received. We just got some real and exclusive information and photos of the upcoming Gridseed Blade Miners from MinerEU.com, an official Gridseed EU distributor. It seems that the new Gridseed Blade Miner will be officially released next week and we already have some real photos and information about the specifications of the hardware. The new blade miner will still use GC3355 ASIC chips, the same same as in Gridseeds USB miners. There are 2 PCB panels in each Blade Miner and each panel has 40 GC3355 chips, or you get a total of 80 chips on a single Blade Miner device. 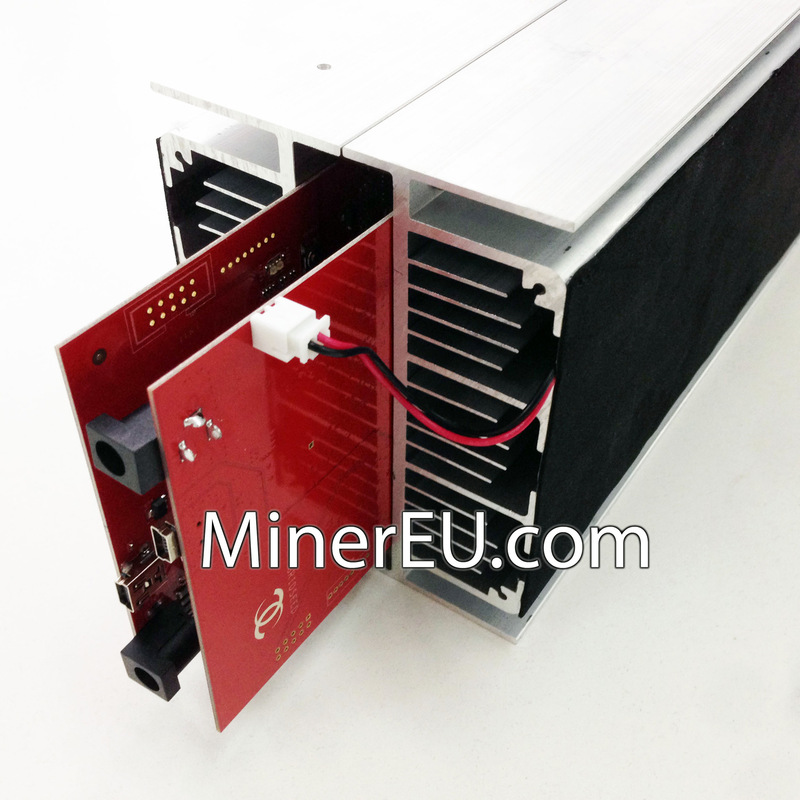 Each PCB of the miner has own power socket and USB port to control it, so it is like having two miners in a single package with. The official Scrypt mining hashrate is 5.2 MHS (2.6 MHS for each PCB), but we believe we should be able to improve that hashrate a lot as what we did with their USB ASIC miners by overclocking and modifying them. We should note that apparently Gridseed is no longer advertising the new Blade Miners for use for BTC (SHA-256) or Dual Mode mining, instead they are intended for use for Scrypt mining only. Using these devices for BTC mining could create power and cooling issues and the resulting hashrate you could expect is definitely not worth it compared to what you should be able to get in Scrypt only mode… especially after overclocking and maybe voltmodding. The new Gridseed 80-chip Blade Miner is equivalent to 16 Gridseed 5-chip USB miners, the official total hashrate is quoted as 5.2 MHS or about 65 KHS per chip, so there should be some room for improvement with overclock and possibly voltmod. The total power usage at default frequency should be around 64-70W for each panel or a total of about 140W per Blade Miner. The device should be compatible with the already available software miners such as cpuminer, cgminer and bfgminer with Gridseed support as it essentially uses the same way of communication with the computer as the smaller 5-chip devices. 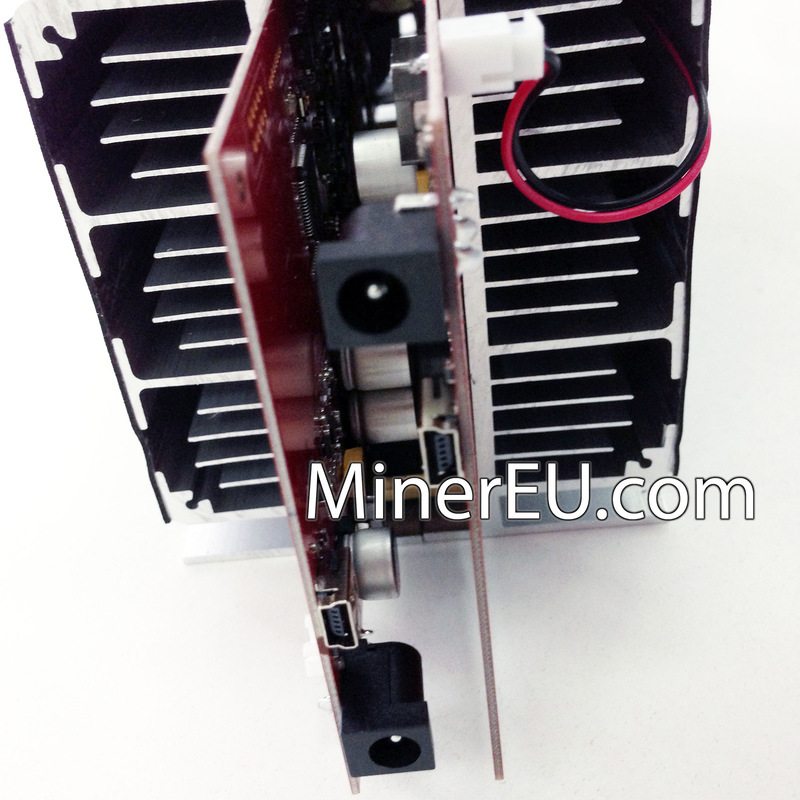 If you are eager to get your hands on these new Gridseed Blade Miners, you can order from MinerEU now and expect a delivery probably sometime next week (deliveries are scheduled to start around April 8th). 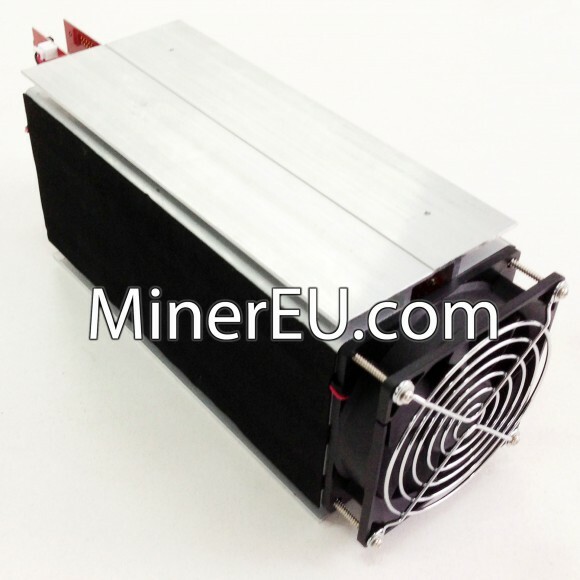 Due to limited availability at the moment, the new miners are not yet publicly listed in their online shop, the order link is intended for their resellers. You can see the official product page of the new Blade Miner on MinerEU’s website with photos and specs, link below. 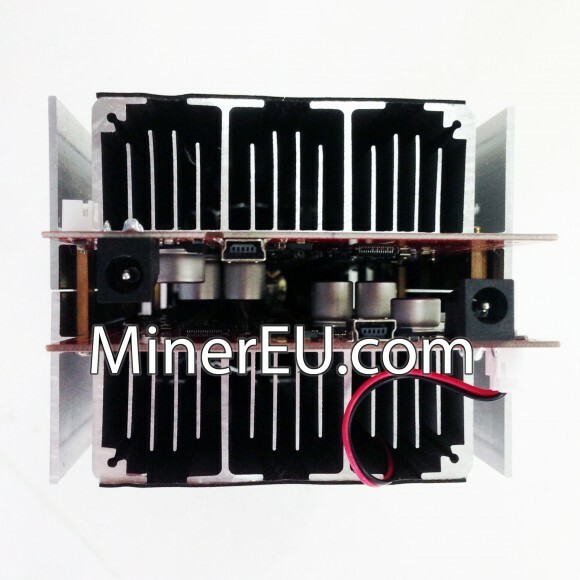 We are going to be ordering one of these devices to be able to play with it more and meanwhile we have been invited to test the new miner by MinerEU, so more details will follow very soon.